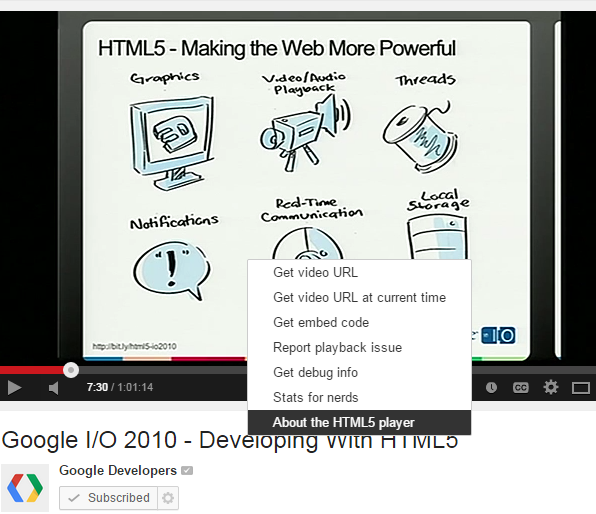 YouTube announced that it now defaults to the HTML5 player for both YouTube.com and YouTube embeds. "YouTube uses HTML5 <video> by default in Chrome, IE 11, Safari 8 and in beta versions of Firefox." Browsers now support features like Adaptive Bitrate streaming and Encrypted Media Extensions, so YouTube can reduce buffering and add content protection without using plugins. The VP9 codec "gives you higher quality video resolution with an average bandwidth reduction of 35 percent", WebRTC provides broadcasting tools, while fullscreen APIs add a feature that used to require plugins, keyboard shortcuts or other browser options. "Given the progress we've made with HTML5 <video>, we're now defaulting to the HTML5 player on the web. We're also deprecating the "old style" of Flash <object> embeds and our Flash API. We encourage all embedders to use the <iframe> API, which can intelligently use whichever technology the client supports," informs YouTube. It's interesting to notice that YouTube's HTML5 page doesn't even let you enable or disable the player in Chrome, IE 11, Safari 8 and in Firefox's beta/dev releases. "The HTML5 player is currently used when possible," mentions the page.